In 1924, Aage Gusmer incorporated our company as the exclusive distributor of a tank coating for the North and South American brewing industry. Today, Gusmer Enterprises, Inc. is one of the leading suppliers of processing aids and equipment to the entire beverage industry, focusing on the beer, wine, juice and distilled spirits segments. Gusmer continues to manufacture and exclusively represent many world-wide suppliers of superior products for fermentation applications. Gusmer also has developed a dominant leadership position in the manufacture and distribution of filtration products (depth filter material, fiber, sheets, stacks, cross flow) and specialty products such as absorbent products and other custom materials. These products are used in a variety of industrial and commercial applications. Gusmer's manufacturing plants have achieved ISO 9001 status. Gusmer is continuing to expand into synergistic applications such as new processing products for food, and recently obtained its first GMP certification. Our core values of ethical integrity and commitment to excellence remain the foundation of our company. Gusmer's Service with Knowledge® is our hallmark, providing stellar service with in-house technical expertise and a consultative sales approach. Gusmer is well-known for its quality, dependability and flexibility in addressing business needs. Gusmer's offices/warehouses are strategically located throughout the USA, and our domestic and international distributors enhance further our accessibility to our customers. Gusmer is proud of the long-term collaborative partnerships that we continue to grow and develop with customers, employees and vendors. Continuous improvement and innovation are the heart of Gusmer as we seek to provide products that make the products we use as consumers the best that they can be. Gusmer Enterprises is uncompromising in raw material selection. Only the highest quality American and French oak from premium heartwood qualifies for our programs. Our proprietary toasting process brings out very distinct oak attributes, such as vanilla, butterscotch, clove, smoke, and others. Consistent, predictable results are the hallmark of Gusmer's oak program, offering only the finest oak adjuncts. Equipment - OenoFoss, refractometers, pH meters, scales, stir plates, etc. Chemicals - pH buffers, alcohol, copper sulfate solutions, hydrochloric acid, etc. 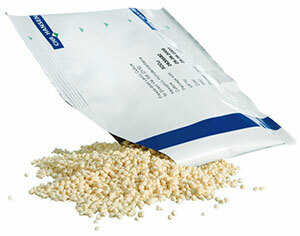 Consumables - Kimwipes, Parafilm, etc. Labware - flasks, cylinders, beakers, pipets, etc. Microbial Monitoring - culture media, membrane filtration, test kits, reference materials, etc. Grape and Juice Samples - Always include a cooler pack with grape clusters or juice samples. When possible juice and fermenting samples should be dropped off at our facility as they are liable to ferment. Cellar Samples - Take a representative sample of the wine., using proper composite samples if the wine is in several tanks or barrels. Bottled Wines - An unopened bottle is required for post-bottling microbial analysis. The Utilization of non-Saccharomyces vs. Saccharomyces Yeast, presented by Dr. Hentie Swiegers from Chr. Hansen’s Wine Innovation Department. The latest applications of non-Saccharomyces and Saccharomyces yeast producing unique and stylistic wines that are redefining winemaking. Optimize your final filtration process prior to bottling. Final filtration is the ultimate guarantee of a wine’s quality and microbial stability. Topics include: filter and membrane options, running the filtration, integrity testing, and maximizing throughput and filter economics. Join us for this complimentary seminar on Analytical Methods for Wineries and FTIR Instruments, Tues May 14th - presented by Gusmer Enterprises. This event offers a great opportunity for wineries currently considering starting a lab, bringing analysis in-house, or looking to upgrade to all-in-one instruments. Please RSVP by May 7th, seating is limited. Each session will be presented to allow for time for questions and answers. Gusmer will also have additional personnel available to answer questions during sessions, during breaks, at the complimentary lunch, or after the program has finished. Gusmer is increasingly working with financial services companies to meet the needs of wineries and help them obtain the equipment to take their operations and wine quality to the next level. With monthly payments often less than $400/month – leasing an OenoFoss can offset many times that cost spent at outsourced laboratories, while avoiding the need for a single large capital expenditure. Financial services companies often have a variety of plans to fit each customer’s needs. Contact Gusmer today at sales@gusmerenterprises.com for more details! Divergan F ® (PVPP), BASF’s unique polymerization process produces the purist polyvinylpolypyrrolidone, which is completely insoluble in must and wine. Divergan F is selective in binding phenolic species such as catechins and leucoanthocyanidins with minimal effect on flavor and aroma. It is frequently used to stabilize the delicate color in White Zinfandel and to help prevent “pinking” in certain white wines, thus ensuring a proper shelf life. Be Prepared for Bottling Season with MilliporeSigma Cartridges! Why do so many wineries and mobile bottlers use MilliporeSigma filters? Be prepared for the bottling season with the wine industry’s #1 cartridge filters from MilliporeSigma! Tannins have multiple functions that can influence the structure, mouthfeel, and color in red wine. 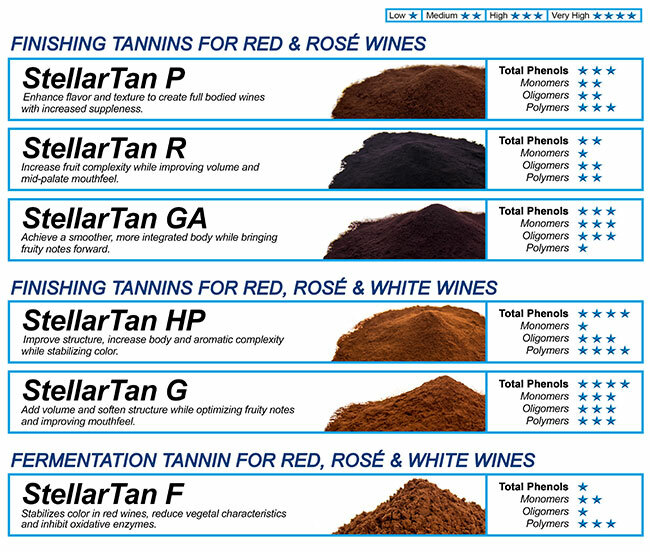 StellarTan™ tannins are available in a wide range of tannin activity, designed to optimize structure in wine. Tannin activity (Figure below) is the relative measurement comparing the tannin’s reactivity and ability to bind, and is influenced by the degree of tannin polymerization within the wine as well the concentration of monomeric, oligomeric, and polymeric tannins. StellarTan HP has the highest tannin activity and a higher proportion of oligomers and polymers that make it an excellent choice for adding structure. On the other end of the activity range, StellarTan GA, a softer tannin with the lowest concentration of polymers and a higher amount of monomers, is an superb choice for wines that have some structure but need fine tuning. StellarTan tannins are available to complement any stylistic requirement and can help enhance the natural complexity in your wine. StellarTan premium finishing tannins are available in 1 kilogram or 20 kilogram pack sizes. Contact your local Gusmer Representative for samples. Chr. Hansen Wins 2019 Most Sustainable Co. Award! Chr. Hansen has just been ranked as the most sustainable company in the world by Corporate Knights, a specialized Toronto-based media and investment research firm. This was announced during the World Economic Forum in Davos, Switzerland, on January 22, 2019, upon the release of Corporate Knights’ 15th annual Global 100 Most Sustainable Corporations in the World ranking. More than 7,500 companies have been analyzed against global industry peers on a number of quantitative key performance indicators. Chr. Hansen scored 100% on the ‘clean revenue’ indicator, reflecting that the company’s products have clear environmental and certain social benefits, as stated in Corporate Knights’ definition. Tannins sourced from California wine grapes for wine! StellarTan finishing and fermentation tannins are an effective tool to help you bring out the best in your wine. Available in 1 kilogram packs or bulk 20 kilogram boxes. Gusmer offers a full range of innovative enological tools, please visit us at the Unified Symposium booth #1004 or contact us today. StellarTan premium finishing and fermentation tannins from Polyphenolics are condensed tannins derived from California wine grape varietals without the use of solvents. These tannins solubilize instantly and completely in wine. 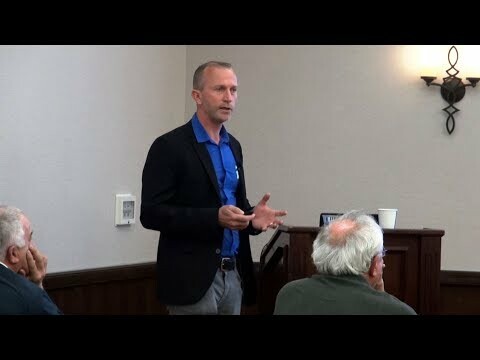 For more information on tannins and their application in winemaking, please click on the video to watch Dr. James Kennedy of Polyphenolics in our 4-part tannin series. Act Now to Stock up on Filters and Obtain 2018 Pricing! To achieve the best process economics an efficient winery must operate on a Total Cost of Filtration basis. This recognizes that superior filter performance will yield better economics over time. Filter cost must consider total gallons throughput per change-out. A Total Cost of Filtration approach also realizes that factors influenced by filter performance are often more costly than the filters themselves. wine industry’s #1 cartridge filters from MilliporeSigma! Come visit Gusmer booth #229 at the WIN Expo, Thursday Dec 6th, to see all the latest products including Polyphenolics StellarTan premium finishing and fermentation tannins. We will also have the OenoFoss wine analysis in the booth! Take advantage of 2018 FOSS limited pricing, ask us for details. FOSS Wine Analysis: Act now to take advantage of 2018 pricing! Act now to take advantage of 2018 pricing! For the lowest capital cost ever, improve the Quality of your wines today with fast, in-house analysis of key parameters with the OenoFoss. Since its introduction in 1999, the WineScan has revolutionized rapid routine wine analysis for winemakers and laboratories around the world providing fast and accurate analysis of critical quality control parameters. The new WineScan SO2 provides rapid, integrated measurement of free and total sulfur dioxide analysis in addition to the other parameters all in just one minute. Join the countless wineries, university and research programs, and outsourced testing labs using the WineScan platform today. 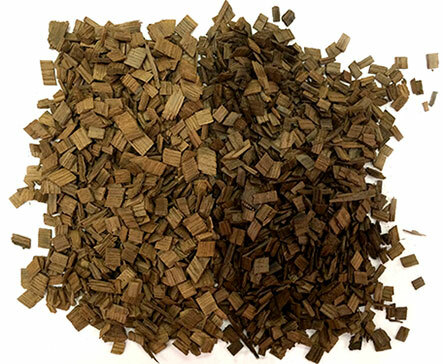 Arôbois’ new Arôneo range of French oak chips, produced through a truly innovated process, are distinctly flavorful and aromatic. Available in four different grades, each with a different contribution to the structure and organoleptic profile of wine. Gusmer Enterprises, Inc. is a leading manufacturer of oak products for the wine industry. As a pioneer in the oak adjunct market, Gusmer introduced the use of Oak-Mor granular oak to the winemaking process in the early 1970’s. With the launch of our Oak Avantage, we now offer a wide range of chips and granular oak products to wineries worldwide. Gusmer is uncompromising in raw material selection. Only the highest quality American and French oak from premium heartwood qualifies for our programs. Our proprietary toasting process brings out very distinct oak attributes, such as vanilla, butterscotch, clove, smoke, and others. Consistent, predictable results are the hallmark of Gusmer’s oak program, offering only the finest oak adjuncts. Granular & Liquid Wine Enzymes Available from Gusmer! pectolytic enzymes for your wines! BioSelect Clear is a robust blend of pectinases for rapid depectinization and clarification of red, white, rosé, or fruit wines. BioSelect Blanc is a concentrated blend of pectinases with low cinnamoyl esterase for maceration of grapes in the production of quality white or roséwines and other fruits in the production of fruit wines. BioSelect Noir is a concentrated blend of pectinases for maceration of grapes in the production of premium red wines. BioSelect Aroma Plus is a rich blend of pectinases with beta-glucosidase activity for aroma release in white and rosé wines. Frees bound terpenes to enhance varietal aroma compounds. PEKTOZYME Clear is a concentrated pectinase for depectinization and clarification of red, white, rosé, or fruit wines. PEKTOZYME Mash is a robust pectinase preparation designed formaceration of red, white, or rosé grapes in the production of wine and other fruits in the production of fruit wines. Protect Your Wine: Tools to treat the effects of challenging weather! With the recent change in weather, are you worried about fruit quality? Gusmer has a variety of tools to prevent infections and treat laccase formed by Botrytis. Lysozyme specifically targets and reduces populations of unwanted lactic acid bacteria (LAB, including Pediococcus, Lactobacillus, and Oenococcus). Among other things, Stellar Tan F- fermentation tannin that can reduce laccase levels on fruit that may have Botrytis. For more information on the advantages of using tannins early in fermentation or during maceration, please seeThe Benefits of Adding Tannins before Fermentation. StellarTan F fermentation tannins are derived from California wine grape varietals without the use of solvents. They are fully soluble in wine and are an easy cost-effective tool to start your winemaking. StellarTan F fermentation tannins are available in 1 kilogram bags or 20 kilogram boxes. NEW Wine Enzymes Now Available from Gusmer! Gusmer Enterprises is excited to announce the arrival of BioSelect™ and PECTOZYME™ a complete line of pectolytic enzymes for your wines! Gusmer’s MicroEssentials™ fermentation nutrients include a complete range of supplements for yeast rehydration, primary fermentation and malolactic fermentation. Based on the latest research, our formulations contain premium ingredients that impart highly refined polypeptides, amino acids, essential vitamins, minerals and yeast survival factors, for a rich source of compounds that are highly assimilable by yeast and bacteria. Used to support cell growth, general metabolism, protein synthesis and alcohol tolerance, these nutrients contribute greatly to healthy fermentations and help guard against the formation of hydrogen sulfide and other unwanted metabolites. MicroEssentials fermentation nutrients comply fully with the TTB regulations and are produced locally in our own facility, under GMP conditions. Get ready for Harvest with In-House Wine Analysis! For the lowest capital cost ever, improve the Quality of your wines today with fast, in-house analysis of key parameters using the OenoFoss platform. Join the hundreds of wineries improving the quality of their wines with instant results at no cost per test! NEW StellarTan Tannins - Samples Available! Gusmer Enterprises is excited to partner with Polyphenolics to offer StellarTan® premium tannins. Polyphenolics, a leader in the development of enological tannins produced from wine grapes, utilizes a revolutionary process in which pure grape tannins are extracted from fully developed grapes with gentle processing techniques that respect and preserve the true nature of grape tannins. StellarTan premium tannins solubilize instantly and completely in wine, giving winemakers full control to balance tannins for optimal structure, mouthfeel, finish, color stabilization, flavor, and aroma. Click here to download the product data sheet. Join us for this complimentary technical seminar on Wine Filtration - presented by Gusmer Enterprises. Optimize your final filtration process prior to bottling. Final filtration is the ultimate guarantee of a wine's quality and microbial stability. Topics include: filter and membrane options, running the filtration, integrity testing, and maximizing throughput and filter economics. 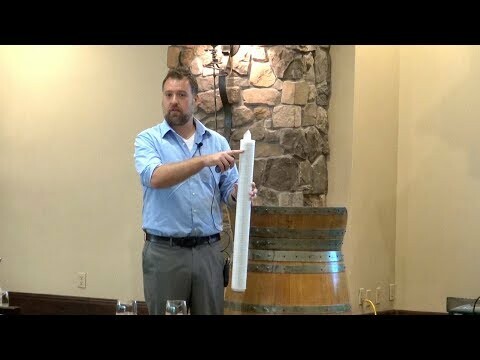 Learn about the operation and optimization of sheet and lenticular filter media used throughout the wine industry. Each of the sessions is presented in a small group format with time for questions and answers. Gusmer will also have additional personnel available to answer questions during sessions, during breaks, at the complimentary lunch, or after the program has finished. Bucher Vaslin has become the leader in cross flow filtration with innovations that allow winemakers to process juice, wine, and lees without the need for diatomaceous earth. The Bucher cross flow features an organic hollow fiber membrane that allows for brilliantly filtered wine or juice, while limiting the retention of desirable polyphenols and polysaccharides. The complete and fully automated nature of the Bucher Vaslin cross flow is perhaps its greatest feature. for backflushing, cleaning, and sanitation. required accessories which are fully integrated for efficient operation. Gusmer is the local authorized service agent for Bucher Vaslin cross flow systems. An efficient winery must operate on a Total Cost of Filtration basis. This recognizes that superior filter performance will yield better economics over time. Filter cost MUST consider total gallons throughput per change-out. A Total Cost of Filtration approach also realizes that factors influenced by filter performance are often more costly than the filters themselves. A high quality filter cartridge is key to maximizing total throughput and reducing the Total Cost of Filtration. Gusmer Enterprises is proud to announce its partnership with Polyphenolics, a leader in the development of enological tannins produced from wine grapes. Located in the heart of one of California’s major grape growing regions, Polyphenolics utilizes fully developed grapes that are carefully selected and put through a revolutionary process, in which pure grape tannins are extracted with gentle processing techniques that respect and preserve the true nature of grape tannins. StellarTan premium tannins solubilize instantly and completely in wine and give winemakers full control to balance tannins for optimal structure, mouthfeel, finish, color stabilization, flavor, and aroma. Gusmer offers a full range of innovative enological tools that enable your creative expression through unique and interesting wines. Fermentation and processing aids, filtration media and equipment, analytical products and instrumentation, and analytical laboratory services, all backed by strong Gusmer technical support. Please visit us at booth #1004 to see all our latest products or contact us today. TAKE ADVANTAGE OF 2017 PRICING! For the lowest capital cost ever, improve the Quality of your wines today with fast, in-house analysis of key parameters. OenoFoss - Last Chance 2017 Pricing! ORDER NOW TO TAKE ADVANTAGE OF 2017 PRICING! Special Promo from Gusmer at the Wine Industry Expo! Come visit Gusmer booth #229 at the WIN Expo, Thursday Nov 30th, to receive 40% off* your next submission of unlimited samples for FOSS Complete Wine Analysis! Offer valid day of the show only and must submit samples all at once by February 28th, 2018. Tubes and sample labels available upon request (50mL). Analysis valid only at the Napa location or Windsor- Sonoma Store location. *Restrictions may apply; visit Gusmer booth #229 for full details. Bucher Vaslin RO systems are made specifically for the wine industry to give winemakers options during production. In addition to juice concentration and alcohol adjustment; RO can be used for taint removal such as VA, smoke taint, and other targeted wine faults. Bucher Vaslin systems are well priced, compact, portable, and easy to use. Having a unit in-house gives increased flexibility and reduces costly outsourcing fees. Come visit Gusmer booth #229 at the WIN Expo, Thursday Nov 30th, to receive 40% off* your next submission of unlimited samples for Foss Complete Wine Analysis! Offer valid day of the show only and must submit samples all at once by February 28th, 2018. Complete Wine Analysis includes: Free/Total SO2, Alcohol, pH, TA, VA, Malic Acid, Glucose/Fructose. Tubes and sample labels available upon request (50mL). Analysis valid only at the Napa location or Windsor- Sonoma Store location. *Restrictions may apply; please call (707.836.1056 - Windsor, Sonoma County) or (707.224.7903 - Napa) for full details. Please call (707.224.7903 - Napa) or (707.836.1056 - Windsor, Sonoma County) for more information and special pricing. Gusmer Offers a Full Line of Oak Adjuncts! You might not be aware of the fact that different commercial yeast vendors recommend different ways to prepare the active dry yeast before inoculation. Therefore, it is very important to follow the instructions on how to conduct a proper rehydration and reactivation of active dry yeast before inoculating the grapes. View our new video to help you conduct a proper rehydration and reactivation of Chr. Hansen dry yeast before inoculating. We will examine the effects of the proper water temperature vs. water temperature that is too high during rehydration. Renaissance Yeast: H2S - Prevention is the Best Cure! Hydrogen sulfide is produced by most strains of Saccharomyces during fermentation in trace amounts, below sensory threshold levels. The effects of hydrogen sulfide are obvious at higher levels, but at levels below sensory threshold, hydrogen sulfide leads to “closed or masked” wines, hindering the full expression of flavor and aroma compounds. In contrast, wines are much more “open and bright” when trace amounts of hydrogen sulfide are not present. Renaissance Yeast have the natural inability to produce hydrogen sulfide. Renaissance Yeast is a selection of yeast strains based on the strain UCD932 (from the University of California, Davis), which was isolated from a vineyard in Italy and has the natural inability to produce hydrogen sulfide in grape must. Through natural breeding techniques (non-GMO), UCD932 was crossbred with classic wine strains to produce progeny strains that have all of the desired characteristics of the parent strains and the inability to produce hydrogen sulfide. MicroEssentials Oenos is a complex nutrient that was developed specifically for malolactic fermentations, and is a rich source of amino acids, peptides, B-complex vitamins and trace minerals. Nutritional requirements are different for bacteria than for yeast. Unlike yeast, bacteria can neither store nor synthesize all essential amino acids required for growth. Therefore nutrients must be available from the environment. Post alcoholic fermentation wines can often be nutrient deficient due to nutrient utilization by yeast… and yeast are often slow to lyse and release nutrients back into the wines after fermentation. Nutritional depletion can stall or cause sluggish malolactic fermentations. Nutrient supplementation during the bacterial inoculation can enhance the growing conditions and speed the malolactic fermentation. MicroEssentials Oenos is strongly recommended for wines that present challenging conditions, such as high S02,high alcohol, low pH. Chr. Hansen led the charge in the development of non-Saccharomycesyeast strains with the creation of their screening and selection programs of non-Saccharomyces yeast over a decade ago. Since then, three pure culture strains, and three mixed culture preparations have become widely utilized in winemaking. Known for distinct and complex flavors and aromas, and increased mouthfeel, the Chr. Hansen non-Saccharomyces yeast are an excellent means to accentuate quality and produce unique wines. Chr. Hansen’s non-Saccharomyces yeast is a great tool for progressive winemakers in the creation of outstanding wines. OenoFoss - New Lower 2017 Pricing! NEW LOWER PRICING FOR 2017! Gusmer Enterprises is excited to announce the release of its NEW 2017-2018 Wine Catalog! Come download your digital copy today and watch the mail for your printed catalog in the coming weeks. If you are not already on our mailing list please contact us here. Join us for the complimentary technical seminar: The Latest Yeast & Bacteria trends in the Wine Industry - presented by Gusmer Enterprises. Please RSVP by May 8th, seating is limited. The Utilization of non-Saccharomyces vs. Saccharomyces Yeast,presented by Dr. Hentie Swiegers from Chr. Hansen’s Wine Innovation Department. The latest applications of non-Saccharomyces and Saccharomyces yeast producing unique and stylistic wines that are redefining winemaking. Moving Beyond H2S: Breeding Yeast for Oenological Traits,presented by Eleni Kinti, Oenologist at Renaissance Yeast. Renaissance Yeast is an industry leader in the development of classically bred yeast (Non-GMO) based on the latest university research and strain selection. Cultures for Bio-Protection, the Future of Winemaking, presented by Anne-Claire and Karen Olks of Chr. Hansen. Learn how wineries are utilizing beneficial yeast and bacteria proactively for the control of spoilage organisms, such as Brettanomyces, and the reduction of sulfur dioxide. Biological control is both responsible, eco-friendly, and will change the way wines are produced in the future. Essential Knowledge to Manage Malolactic Fermentation, presented by Dr. Peter Sommer from Gusmer Enterprises Inc. R&D department. The fundamentals of managing the malolactic fermentation process. Is every commercial product of malolactic bacteria of same quality and cell numbers? What is the required amount of bacteria cells to add to initiate the malolactic fermentation? If you have any questions, please email us at gusmerwine@gusmerenterprises.com . 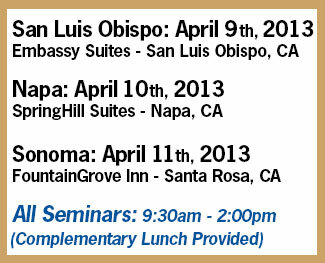 Complimentary Gusmer Wine Technical Seminar - Yeast & Bacteria Trends! 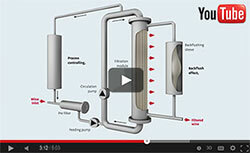 Cross Flow Wine Filtration - Watch Video How it Works! Bucher Vaslin has become the leader in cross flow filtration with innovations that allow winemakers to process juice, wine, and lees without the need for diatomaceous earth. The critical component to the Bucher Cross Flow Filter is the microporous membrane made specifically for wine filtration. Bucher Vaslin offers a number of sizing options to accommodate any sized winery. The Flavy FX2 starts at 200 gph, and the Flavy FX300 can filter up to 9,000 gph. All of the Bucher Cross Flow Filters are fully automated, making the operation simple and very user friendly. 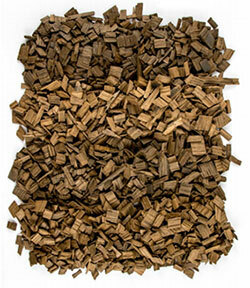 Arôbois’ has developed the unique and high-performance range of Arôneo French oak chips in an innovative production process. Available in four different grades, each with a different contribution to the structure and organoleptic profile of wine. CLICK HERE to learn more about Arôbois Oak and other oak products available through Gusmer Enterprises. Chr. Hansen has led the charge in the development of non-Saccharomycesyeast strains with the creation of their screening and selection programs of non-Saccharomyces yeast over a decade ago. Since then, three pure culture strains, and three mixed culture preparations have become widely utilized in winemaking. Known for distinct and complex flavors and aromas, and increased mouthfeel, the Chr. Hansen non-Saccharomyces yeast are an excellent means to accentuate quality and produce unique wines. Chr. Hansen’s non-Saccharomyces yeast is a great tool for progressive winemakers in the creation of outstanding wines. Gusmer offers a full range of innovative enological tools that enable your creative expression through unique and interesting wines. Fermentation and processing aids, filtration media and equipment, analytical products and instrumentation, and analytical laboratory services, all backed by strong Gusmer technical support. Please visit us at booth #1004 to see all our latest products or contact us today sales@gusmerenterprises.com. For over 90 years, Gusmer has offered a full range of innovative enological tools that enable your creative expression through unique and interesting wines. Fermentation and processing aids, filtration media and equipment, analytical products and instrumentation, and analytical laboratory services, all backed by strong Gusmer technical support. We understand that every winemaker can make their own mark within the industry and we are here to support with products that will help you reach your goals. Please contact us today sales@gusmerenterprises.com. Bucher Vaslin has become the leader in cross flow filtration with innovations that allow winemakers to process juice, wine, and lees without the need for diatomaceous earth. The Bucher cross flow features an organic hollow fiber membrane that allows for brilliantly filtered wine or juice, while limiting the retention of desirable polyphenols and polysaccharides. Contact Gusmer today sales@gusmerenterprises.com for pricing or questions! What final membrane is best for your winery? 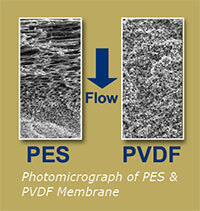 PVDF cartridges provide many critical advantages over PES cartridge filters. An efficient winery must operate on a Total Cost of Filtration basis. This method of operating recognizes that superior filter performance will yield better process economics over time. Year End FOSS Clearance! Limited Time Only! Improve the Quality of your wines today with fast, in-house analysis of key parameters. Must and fermenting must calibrations added at no additional cost! *Promotion ends Dec 15, 2016 - Contact your local sales rep for full details. High Alcohol or Challenging Malolactic Fermentations? We have your solution! High Alcohol or Challenging Malolactic Fermentations? Chr. 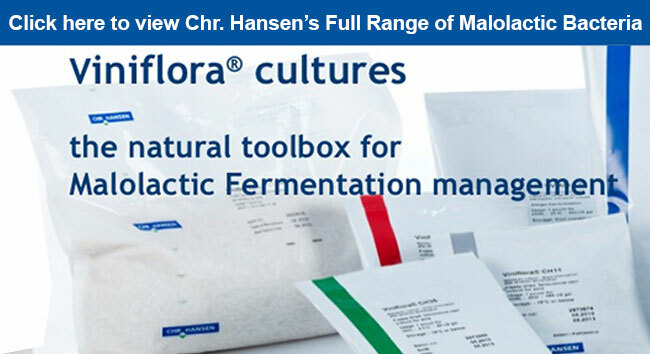 Hansen Viniflora® CH16 - for optimal control over Malolactic Fermentation. Chr. Hansen’s Viniflora malolactic bacteria cultures are known by winemakers worldwide for their high cell viability (106 cells per ml of wine) and fast, consistent results. 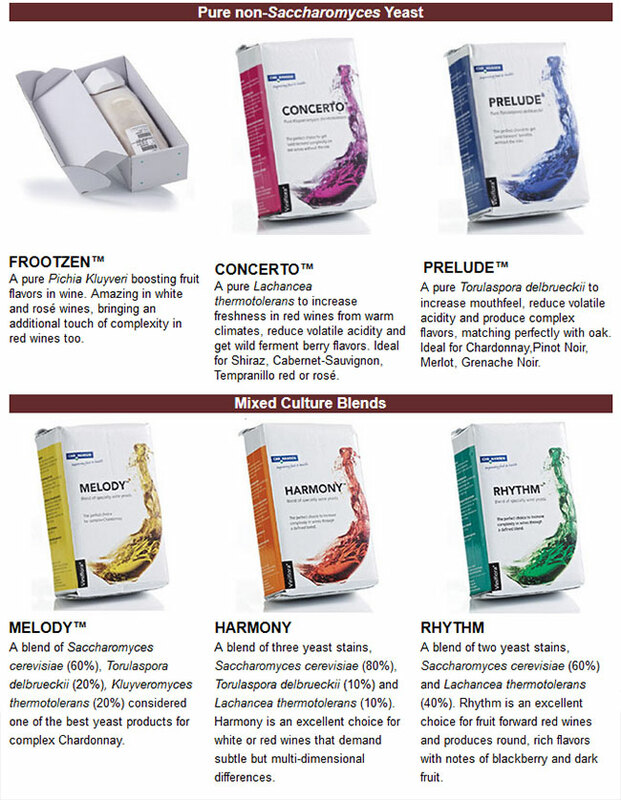 ▪ Viniflora freeze-dried cultures are adapted for direct inoculation into wine. Rehydration is not required. As the world leader in bacterial cultures for food industries, Chr. Hansen has committed Research and Development and advanced production resources to providing the best malolactic bacterial cultures to the wine industry. Chr. Hansen preparations are not only tested for viability, but each batch is also tested for the cell’s ability to covert malic acid to lactic acid (the ‘Malic Acid Conversion Capacity Test’). Chr. Hansen is the only company that utilizes the ‘MACC’ test as a quality control parameter for each batch produced. 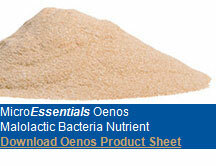 Viniflora® Oenos is a freeze-dried, direct inoculation starter culture of Oenococcus oeni. It has an excellent all around tolerance towards pH, alcohol, temperature and SO2. ▪ Pouch size availability - 66 gal, 660 gal and 6,600 gal dose. Gusmer Offers Full Line of Oak Alternatives! Chr. Hansen non-Saccaromyces Yeast - Get the Best from Your Wines! Chr. Hansen led the charge in the development of non-Saccharomyces yeast strains with the creation of their screening and selection programs of non-Saccharomyces yeast over a decade ago. Since then, three pure culture strains, and three mixed culture preparations have become widely utilized in winemaking. Known for distinct and complex flavors and aromas, and increased mouthfeel, the Chr. Hansen non-Saccharomyces yeast are an excellent means to accentuate quality and produce unique wines. Chr. Hansen’s non-Saccharomyces yeast is a great tool for progressive winemakers in the creation of outstanding wines. 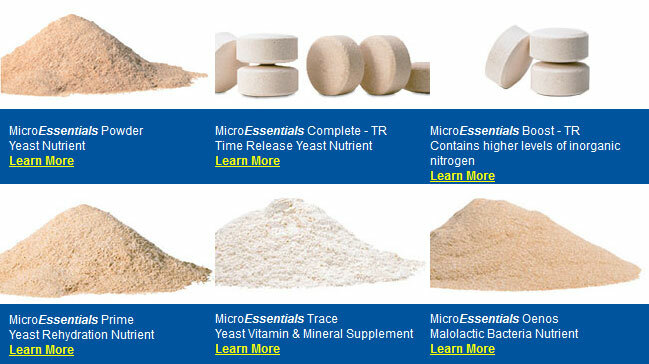 MicroEssentials™ Oenos is a complex nutrient that was developed specifically for malolactic fermentations, and is a rich source of amino acids, peptides, B-complex vitamins and trace minerals. We are excited to also announce that Phil Chou has joined Gusmer as an R&D Applications Specialist. In his role, Phil will leverage his strong technical experience in wine and brewing in developing new processing capabilities and consulting on new application opportunities with a chemistry focus. Phil’s technical background includes a PhD in chemistry with focused work worked in the wine and beer industry for many years, in flavor chemistries and new analytical technologies. Phil started with Gusmer on May 16 and is located in our Fresno, CA facility. Does your wine have the nutrients it takes to go the distance? H2S - Prevention is the Best Cure! Hydrogen sulfide is produced by most strains of Saccharomyces during fermentation in trace amounts - below sensory threshold levels. The effects of hydrogen sulfide are obvious at higher levels, but at levels below sensory threshold, hydrogen sulfide leads to “closed or masked” wines, hindering the full expression of flavor and aroma compounds. In contrast, wines are much more “open and bright” when trace amounts of hydrogen sulfide are not present. Renaissance Yeast have the natural inability to produce hydrogen sulfide. 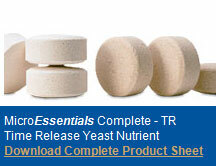 Click the image below to learn more about Renaissance Yeast products! Chr. Hansen's Viniflora® direct inoculation malolactic bacteria is convenient to use and represent the highest quality available on the market. Chr. Hansen’s scientists have developed a unique method which measures the bacteria’s ability to convert malic acid to lactic acid, known as the ‘Malic Acid Conversion Capacity' test. This is one of many quality control parameters by which every batch of Viniflora bacteria is tested. It’s this dedication to quality that makes Viniflora the most widely used malolactic bacteria in the industry. Gusmer Enterprises is excited to announce that Peter Sommer has joined Gusmer as our Biological Products Technical Manager. In this role he will be responsible for development and support of Gusmer’s manufactured biological products as well as providing the technical support of the products we represent through our supplier partnerships. Peter brings an impressive background including a PhD in microbiology and vast experience in new product development and application support of fermentation processes, particularly wine. Peter started with Gusmer on May 1 and will be relocating to our Fresno, CA facility in August. Gusmer Releases NEW 2016-17 Wine Catalog - Download Today! Gusmer Enterprises is excited to announce the release of its NEW 2016-2017 Wine Catalog! Come download your digital copy and see new products that Gusmer is offering. Watch the mail for your printed catalog in the coming weeks. If you are not already on our mailing list please contact us here. *This PDF catalog is interactive. Starting on page 2, you’ll see “View Table of Contents” in the top right or left corner. Clicking on this will direct you to the table of contents page, which will direct you to an individual page by clicking on the item of interest in the table of contents. Also, clicking on the subject bar, on the outside of the page, will take you to a specific section within the catalog. TheOenoFoss FTIR-based analytical platform allows fast, real time monitoring of your wine's key parameters. The OenoFoss offers significant savings that will pay for itself and gives the additional flexibility of immediate results and unlimited testing on your schedule. Complete and accurate juice and wine panels (including SO2), fast turn-around, provided by our OenoFoss and WineScan. New pricing on the FOSS WineScan available at the Gusmer Napa Lab & Gusmer Sonoma Store. Prices start at $40/panel for wine and juice samples! Please call (707.224.7903 - Napa) or (707.836.1056 - Windsor, Sonoma County) for more information. FTIR technology by FOSS includes the OenoFoss and the WineScan; they are the leading analytical technology in the wine industry and outsourced analytical labs all over the world. Contact Gusmer today sales@gusmerenterprises.com to learn more about out special 2016 pricing! Visit Gusmer's website to download the Product Data Sheet. We are excited to announce that our new website is up and running! Click here to explore our new site which aims to create a user friendly experience with easy access to all of Gusmer’s products and services. Don’t forget you can also get the latest Gusmer News and Events on Social Media. Visit us at the Unified Wine&Grape Symposium Booth #1004 to see all the latest products from Gusmer Enterprises! Gusmer Enterprises Inc. is pleased to announce the launch of our newly designed website. Our goal with the new website is to provide our current and future customers a user-friendly experience along with easy access to all of the latest information on Gusmer’s products and services. Come see our new website at www.gusmerenterprises.com. We hope you enjoy our new site, if you have any comments, questions, or suggestions please feel free to contact us. wish you and your family a happy and healthy holiday season! INQUIRE TODAY FOR A QUOTE! The OenoFoss FTIR-based analytical platform allows fast, real-time monitoring of your juice, fermenting juice and wine's key parameters. • Save tens of thousands of dollars annually in outsourced testing costs Join the thousands of customers around the world using the OenoFoss to save money, speed results, increase sampling sizes, and improve your wines. Click here to view the demo, customer testimonial and product sheet on the OneoFoss. 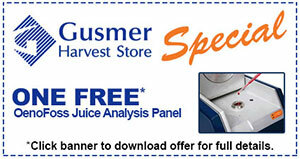 WineScan Analysis Now Available at Gusmer Sonoma Store! We’re excited to announce the expansion of our analytical services at our Sonoma Store with the addition a new FOSS WineScan. Complete wine panels, including free and total SO2, all for $40.00 per panel. FTIR technology by the FOSS WineScan is the leading analytical technology trusted by wineries and wine laboratories throughout the world. 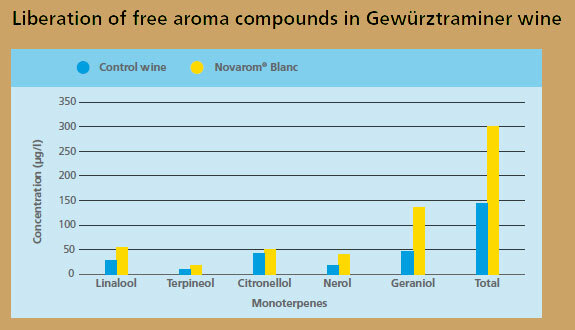 Novozymes enological enzymes are highly purified to control cinnamyl esterase activity and preserve delicate wine aromas. Thank you for taking the time to participate in this brief (three minute) survey. The survey is designed to gain additional insight into market needs and desires regarding cross flow filtration. All information will be kept confidential and is only being used for internal market research. No one will contact you as a result of the survey, unless otherwise requested. Please enter your email address at the end of the survey for a chance to win a $100 VISA gift card! August is National Yeast Nutrient Month! Nitrogen, the most important yeast nutrient, has a significant impact on wine fermentation. Low nitrogen levels can result in stuck or sluggish fermentations, the development of hydrogen sulfide and a reduction in the true expression of the yeast strain and grape varietal. Thirty years ago the wine industry standard for nutrient supplementation was DAP as an inorganic nitrogen source. That lead to the further understanding of supplementation with complex nutrients, rich in organic nitrogen, as well as vitamins/minerals and other essentials. Today the options for fermentation nutrient supplementation focuses on assimilable nutrient components, rich in highly refined polypeptides and amino acids, vitamins/minerals, yeast survival factors – in addition to the point and rate of supplementation. Gusmer’s MicroEssentials nutrient formulations are based on the latest research and produced from premium ingredients all selected to be highly assimilable by yeast and bacteria. Available in both a powder and time-release tablet format, MicroEssentials nutrients offer solutions for nutrient supplementation at inoculation and incrementally throughout the fermentation. 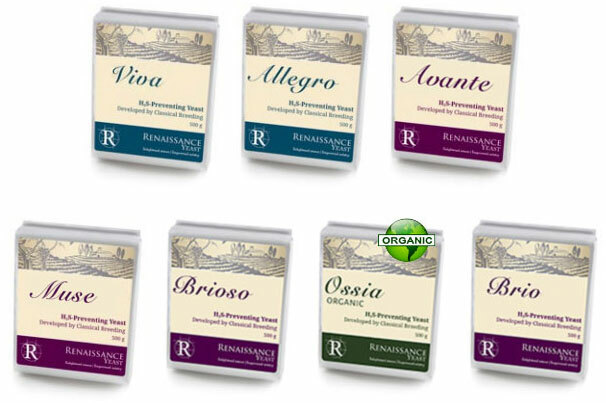 Free Sample: Renaissance Yeast 500 gram pack! Renaissance Yeast is a research and development oriented company that is dedicated to developing premium yeast strains that address some of the wine industry’s most important fermentation challenges. 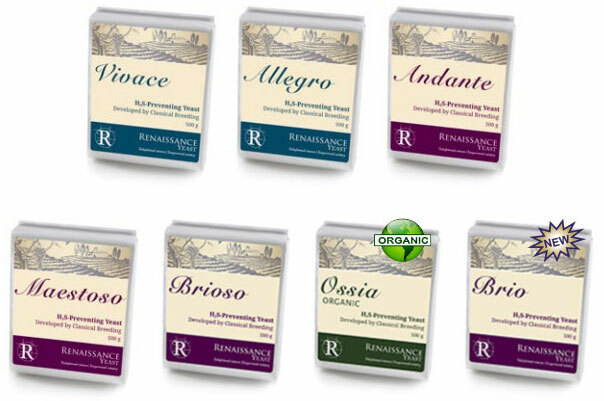 Renaissance has developed a new family of premium wine yeast strains that have excellent fermentation kinetics and organoleptic characteristics, and natural inability to produce hydrogen sulfide in grape musts... all of the attributes that are so important to today’s winemakers – plus the natural prevention of hydrogen sulfide. Try a Renaissance Yeast strain next to your current strain to see the difference. We are so confident that you will like the results, that we will give you a free 500 gram pack to take the Renaissance challenge.Click here www.gusmerenterprises.com/renaissancechallenge to request a 500 gram pack of one of the following four strains. Download our new 2015-16 catalog to learn more about each strain. 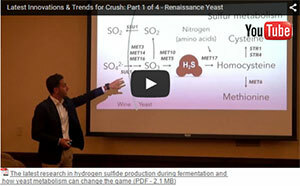 Click the video below to watch “The latest research in hydrogen sulfide production during fermentation and how yeast metabolism can change the game”, presented by Dr. Matthew Dahabieh, Head of Research at Renaissance Yeast. Gusmer releases NEW 2015-16 Wine Catalog - Download Today! Gusmer Enterprises is excited to announce the release of its new 2015-2016 Wine Catalog! Come download your digital copy and see new products that Gusmer is offering. Watch the mail for your printed catalog in the coming weeks. If you are not already on our mailing list please contact us here. CLICK HERE to download the digital version of the catalog. *This PDF catalog is interactive. Starting on page 1, you’ll see “View Table of Contents” in the top right or left corner. Clicking on this will direct you to the table of contents page, which will direct you to an individual page by clicking on the item of interest in the table of contents. Also, clicking on the subject bar, on the outside of the page, will take you to a specific section within the catalog. The Latest Innovations and Trends for the Upcoming Crush Season - a free, small group, technically based seminar presented by Gusmer Enterprises. Seats are filling up - RSVP by May 1st, 2015. The utilization of non-Saccharomyces Yeast, presented by Dr. Hentie Swiegers from Chr. Hansen’s Wine Innovation department. 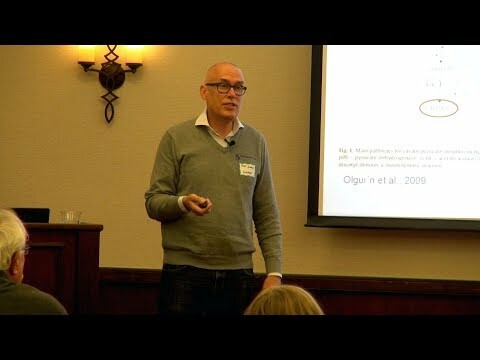 Dr. Swiegers, former Senior Research Scientist at The Australian Wine Research Institute, will discuss the latest applications of non-Saccharomyces to produce unique and stylistic wines that are redefining winemaking. The latest research in hydrogen sulfide production during fermentation and how yeast metabolism can change the game, presented by Dr. Matthew Dahabieh, Head of Research at Renaissance BioScience. Renaissance Yeast is an industry leader in the development of classically bred yeast (non-GMO) based on the latest university research and strain selection. 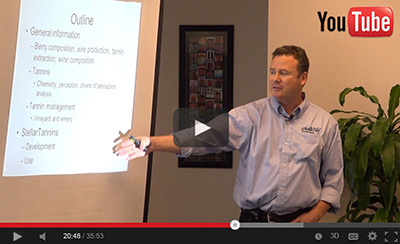 Optimizing must clarification with flotation and proper enzyme utilization, presented by Adam Vart and Bill Merz. The ins and outs of must clarification and flotation techniques, and the proper use of enzymes to achieve the desired outcome. The use of FTIR analysis for grape sampling, juice and fermentation applications, presented by Calvin Watkins and Nate Starbard. Learn the latest FOSS FTIR analytical platforms and calibrations as applied specifically to harvest. Monitor the essential parameters for grape harvesting, juice analysis, primary and secondary fermentations, stuck fermentations and more. Each of the four sessions is presented in a rotating, small group format with time for questions and answers. Gusmer will also have additional personnel available to answer questions during sessions, during breaks, at the complimentary lunch, or after the program has finished. Click here to register or if you have any questions send us an email. The Latest Innovations and Trends for the Upcoming Crush Season - a free, small group, technically based seminar presented by Gusmer Enterprises. The Bucher cross flow unit features an organic hollow fiber membrane made specifically for wine filtration. This hydrophilic membrane allows for brilliantly filtered wine or juice, while limiting the retention of desirable polyphenols and polysaccharides. The Bucher system operates at a very low pressure (maximum 0.7 bar), so the quality of the wine is maintained. The units come turn-key with easy to use onboard controls and feature full automation; including for backflushing, cleaning and sanitation. As a result, The Bucher System is one of the most popular cross flow filters with wineries worldwide. Bucher Vaslin offers a number of sizing options to accommodate any winery. The model FX2 starts at 200 gph, and the model FX300 can filter up to 9,000 gph. Gusmer Enterprises is pleased to bring Pacific Ozone water saving solutions to the beverage industry. Pacific Ozone is a leading supplier of air-cooled, corona discharge ozone generators and integrated ozone contacting systems. In addition to ozone products, Pacific Ozone offers system integration and engineering support to meet the needs of the beverage industry. The robust modular components found in Pacific Ozone industrial equipment are also used in the PC16 and PC25 cart systems – including Pacific Ozone’s air-cooled ceramic and titanium reactor with patented Floating Plate Technology™ - an innovative design that neutralizes the air pressure and vacuum stresses on the critical ozone generating component, producing more ozone with less voltage, less weight and at lower operating temperature - assuring long component service life. The result is a durable, reliable high-output mobile unit that can be used at worksites throughout the winery. Gusmer Enterprises is pleased to announce that it has been designated as the exclusive distributor for Renaissance Yeast and the full line of specialty hydrogen sulfide-preventing yeast strains. This proprietary and novel H2S-preventing technology was discovered by Dr. Linda Bisson at the University of California, Davis. Working under an exclusive license from the University of California, Renaissance Yeast has developed classically bred commercial yeast strains for use in the beverage industry. Learn more about Renaissance Yeast and preventing H2S during cider fermentation at CiderCon, Gusmer’s booth #110. Gusmer Enterprises is excited to announce the Gusmer Harvest Store now has a new name - Gusmer Sonoma Store. The store will be open year-round Mon-Fri 8:30am - 5pm starting Monday, Feb 2nd and will be in the same location in Windsor. We will continue to carry quality winemaking supplies and will be stocking additional products to provide you with even better service. The Crystalline Silica Free (CSF) filter series, has been designed and formulated to be free of crystalline silica yet offer the same outstanding performance of conventional filter sheet media. Gusmer Enterprises’ Cellu-Stacks are a convenient way to utilize depth filtration media in an enclosed cartridge system. EMD Millipore filter cartridges for clarification, presterile, and sterile filtration will ensure microbial stability while maintaining quality, clarity, flavor, and aroma. Win a $90 Gift Card in honor of our 90th Year in Business! In celebration of our 90th year in business, we are giving YOU the opportunity to win a $90 Visa gift card! In order to be entered in the random drawing for a $90 Visa gift card click the below link and share with us your favorite story of how Gusmer products have benefited you and your business. The drawing will be held on December 31st 2014, and the winners will be notified via email. The critical component to the Bucher Cross Flow Filter is the .2 micron polyethersulfone (PES) membrane made specifically for wine filtration. This hydrophilic membrane allows for brilliantly filtered wine or juice, while limiting the retention of desirable polyphenols and polysaccharides. The Bucher system also operates at a very low pressure (maximum 0.7 bar), so the quality of the wine is maintained. As a result, The Bucher System is one on the most popular cross flow filters with wineries worldwide. Bucher Vaslin offers a number of sizing options to accommodate any sized winery. The model FX2 starts at 200 gph, and the model FX300 can filter up to 9,000 gph. All of the Bucher Cross Flow Filters are fully automated, making the operation simple and very user friendly. Join the thousands of customers around the world using the OenoFoss to save money, speed results, increase sampling sizes, and improve your wines. Gusmer’s newly developed range of filter sheet media, the Crystalline Silica Free (CSF) filter series, has been designed and formulated to be free of crystalline silica, yet offer the same outstanding performance of conventional diatomaceous earth based filter sheet media. The CSF series utilizes specially sourced diatomaceous earth that is free of crystalline silica and other impurities, which not only makes for safer handling, but also more neutral in flavors and aromas. Available is a full range of grades and sizes, the CSF series can be relied on for all aspects of wine processing. Gusmer Enterprises’ Cellu-Stacks are a convenient way to utilize depth filtration media in an enclosed system. Offered in all Gusmer media grades, these stack filters can be used for coarse, fine, and presterile filtration in numerous filtration applications. • Clean and safe filtration method with elevated pressures, temperatures, etc. Contact your Gusmer representative for the optimal grade selection for your filtration application. With Chr. Hansen direct inoculation cultures of Oenococcus oeni, no starter preparation is needed. Just add the product directly from the bag to the must or wine. Available as a freeze dried product in small, medium and large pack sizes to treat 66 gallons, 660 gallons and 6,600 gallons, respectively. Chr. 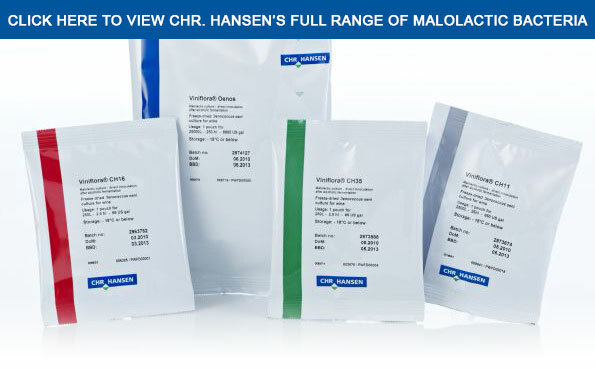 Hansen offers addtional malolactic bacteria strains including: Vinaflora CH35, Vinaflora CiNe, CH 11, Vinaflora Oenos and Vinaflora Oenos 2.0. Click here for additional details on these products. Our laboratory is equipped with the latest analytical instruments and staffed with a diverse group of TTB Certified technicians. We ensure the quality of our services by being a member of the World Wide Inter Lab Testing program, which is endorsed by the ASEV. Our team has expertise in Analytical Chemistry, Enology, Microbiology, Food Science and Applied BioTechnology. If our lab helps you identify a wine problem, we often have information on products, technology or operations that can help resolve that problem. Gusmer Enterprises congratulates Chr. Hansen, recipient of the prestigious Frost & Sullivan 2014 New Product Innovation Leadership Award for Viniflora® non-Saccharomyces yeast and direct inoculation malolactic bacteria. Gusmer Enterprises is proud to be the exclusive distributor of Chr. Hansen’s fermentation products since 1999. Read the full Frost & Sullivan press release here. There are several sources of hydrogen sulfide in wine fermentation, all of which culminate through the sulfate reduction pathway in yeast metabolism. Most frequently hydrogen sulfide is an intermediate in the biosynthesis of Methionine and Cysteine, which are two amino acids required for cell growth and function. The strain UCD 932, a unique wine yeast recently isolated from grape must by the University of California, Davis, that is naturally incapable of producing hydrogen sulfide, has been commercialized by Renaissance Yeast through the development of four new strains. Parent strains were selected for their favorable attributes in wine fermentation and crossbred with UCD 932 through conventional (non-GMO) breeding techniques to produce progeny with the desirable traits of the parent cells and the natural inability to produce hydrogen sulfide. Limited nitrogen content of grape must has been recognized as a cause of problematic fermentations. Initial low levels of assimilable nitrogen can limit growth and biomass accumulation and can result in the formation of by-products such as hydrogen sulfide. To avoid problematic fermentations, consider supplementing with MicroEssentials Nutrients in your winemaking practices. Gusmer Enterprises is proud to announce its partnership with Renaissance Yeast Inc., a leader in the development of classical crossbred H2S-preventing wine yeasts. The H2S-preventing traits in these proprietary and patent-pending wine yeasts were discovered byDr. Linda Bisson and her research team at the University of California, Davis. Renaissance Yeast help winemakers eliminate remediation costs and unmask the wine’s true character and complexity that may be obscured by H2S contamination that naturally occurs as a byproduct of conventional yeast fermentation. A wine yeast strain ideal for artisan style sparkling wines, fruit forward grape wines and fruit wines. A rapid, clean fermenter characterized by its ability to work under diverse conditions, this yeast demonstrates strong fermentation kinetics while preserving the fresh fruit character.Download Vivace product sheet. A wine yeast strain well suited for aromatic expression of any white varietals and is capable of delivering soft mouth feel characteristics. Allegro is exceptional at focusing the fruit either alone or as part of a blend, and is an excellent choice for Chardonnay and Sauvignon Blanc.Download Allegro product sheet. A wine yeast that is ideal for red wines and Chardonnay. Produces an intense fruit overture followed by a mild spiciness and a smooth tannin finish. This strain also imparts good mid-palate fullness with color and flavor stability across all varietals. 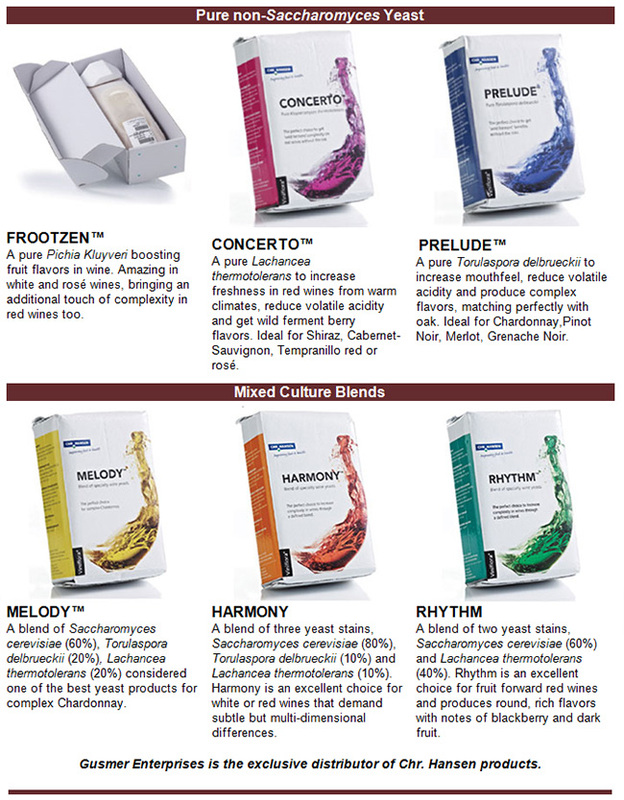 Download Andante product sheet. Recommended for the production of quality red wines with high color and good structure. Maestoso provides excellent flavor and aroma in red varietals. Ideal choice for Merlot, Zinfandel, Cabernet Franc and full-bodied reds. Download Maestoso product sheet. Gusmer Enterprises is looking for a Technical Sales Representative for the Northwest region of the United States. Responsibilities include the promotion, sale, and support of products and services to beverage accounts in the Northwest Region, with the primary territory in Oregon & Colorado. Beverage accounts include brewery, winery, distillery, and juice accounts. Pacific Ozone PC16 and PC25 are complete integrated ozone systems on wheels incorporating oxygen feed gas concentrator, air-cooled ozone generator, mass transfer injector, excess ozone destruction and process controls in an all-stainless steel package that can be rolled to worksites throughout the winery to produce a controlled stream of ozonated water wherever it is needed. Ozone enriched water can be applied as a sanitizer to the inside and outside surfaces of tanks, barrels and kegs, on crusher/destemmers, product bins, hoppers, sorting tables, screw conveyors, pressers, tools, walls, floors and drains. Ozone is the fastest, most effective food grade sanitizer available. It kills microorganisms such as bacteria, fungi, molds, spores, and viruses quickly at nominal concentrations. Generated and dissolved in water on site and on demand, ozonated water eliminates the storage and handling of concentrated hazardous chemicals. Conventional sanitizers leave chemical residue and hazardous byproducts that must be removed by rinsing with water. During ozone sanitation, ozone breaks down as oxygen. Ozone sanitation cycles can eliminate rinse cycles, resulting in significant water savings and conservation. Chr. Hansen's Pure Non-Saccharomyces Yeast...Push beyond the ordinary! Chr. Hansen was the first company to introduce pure strains of non-Saccharomyces yeast into commercial winemaking. Now three strains offered, all of which have been selected for their ability to enhance flavor, aroma and mouthfeel. Use Chr. Hansen non-Saccharomyces yeast in conjunction with your favorite Saccharomyces yeast for distinct wines, reminiscent of a “wild fermentation”, and with complete control. All strains are exclusively available through Gusmer Enterprises, Inc.
Gusmer's New 2014-15 Wine Catalog now available - Download today! Gusmer Enterprises is excited to announce the release of its new 2014-2015 Wine Catalog! Come download your digital copy and see new products that Gusmer is offering. Watch the mail for your printed catalog in the coming weeks. If you are not already on our mailing list please contact us here. * Order any OenoFoss unit with at least one calibration and receive a free Finished Wine Upgrade - a $800 value. 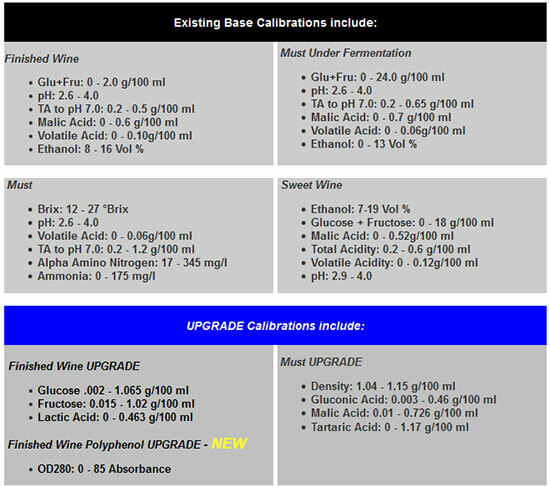 The Finished Wine Upgrade allows for the independent measurement of glucose and fructose as well as lactic acid in finished wine samples. *This offer may be combined with Q2 incentive discounts offered separately. *Order any OenoFoss unit with at least two calibrations at MSRP and receive a free Color VIS Module - a $5,730 value. The Color VIS module measures the wavelength at three different absorbance levels corresponding to the photographic primary colors (Blue @ 420 nm, Green@ 520 nm, Red@ 620 nm) to give an accurate measure of the wine's visual color and conformity. *This offer cannot be combined with other incentives offered separately. • PVDF cartridges provide many critical advantages over PES cartridge filters. • An efficient winery must operate on a Total Cost of Filtration basis. This method of operating recognizes that superior filter performance will yield better process economics over time. • A high quality filter cartridge is key to maximizing total throughput and reducing the Total Cost of Filtration. The DINGA water-saving nozzle is tough and has a long service life thanks to its high-quality brass and stainless steel construction. This nozzle cuts water and energy costs and can help the environment by reducing chemical use in the cleaning process. The water jet can be adjusted from a fine mist to a concentrated stream. In addition, it is covered by a rubber jacket that is heat, cold, caustic, acid and scuff resistant. Win a $90 Gift Card in Celebration of 90 Years of Business! In celebration of our 90th year in business, we are giving YOU the opportunity to win a $90 Visa gift card! In order to be entered in the random drawing for a $90 Visa gift card click the below link and share with us your favorite story of how Gusmer products have benefited you and your business. The drawing will be held on April 30th, 2014, and the winners will be notified via email. Keep an eye out for future promotions and contests! Gusmer’s newly developed range of filter sheet media, the Crystalline Silica Free (CSF) filter series, has been designed and formulated to be free of crystalline silica, yet offer the same outstanding performance of conventional diatomaceous earth based filter sheet media. The CSF series utilizes specially sourced diatomaceous earth that is free of crystalline silica and other impurities, which not only makes for safer handling, but also more neutral in flavors and aromas. Available is a full range of grades and sizes, the CSF series can be relied on for all aspects of wine processing. Please contact your Gusmer representative below for more information. Gusmer Enterprises is pleased to announce a collaboration with Pacific Ozone to bring water saving solutions to the beverage industry. Pacific Ozone is a leading supplier of air-cooled, corona discharge ozone generators and integrated ozone contacting systems. In addition to ozone products, Pacific Ozone offers system integration and engineering support to meet the needs of the wine industry. Gusmer is offering the PC Series of portable generator carts. Known for its controlled application of ozone solution, the PC Series is ideal for barrel washing, tank sanitization, surface disinfection, and clean-in-place (CIP) of tanks and piping. The PC Series is also being utilized in a growing range of food and beverage applications including brewing and dairy processing. To learn more about how Pacific Ozone generators can help your winery please contact Gusmer Enterprises. Gusmer offers a full line of solutions for the wine industry including fermentation and processing aids, filtration media and equipment, analytical products and instrumentation, processing equipment, and analytical laboratory services. Last Chance to Register for the East Coast Educational Seminars! Please join Gusmer Enterprises for an informational session presented around Process Filtration and Microbial Quality Assurance at Bottling. Bottling and Production Managers/Supervisors, QA-QC Managers/Supervisors, Lab Technicians, Sanitation Personnel, Microbiologists, Winemakers and staff. Learn about new technologies for upstream filtration, as well as optimizing existing processes. Topics include: crossflow filtration, sheet and lenticular clarification, and wine preparation for bottling. Adhering to best-in-practice procedures and test materials allows you to check the bottling process and product quality. Topics include: micro testing options and equipment and troubleshooting contamination. Each of the three sessions is presented in a small group format with time for questions and answers. Gusmer will also have additional personnel available to answer questions during sessions, during breaks, at the complimentary lunch, or after the program has finished. Gusmer and FOSS are excited to announce that Gusmer Enterprises has taken over representation for the WineScan product platform into North America. 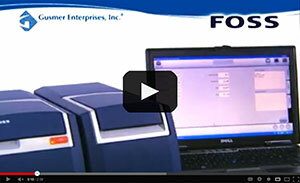 The WineScan by FOSS is the industry’s preeminent analytical technology. It is by far the leading choice for wineries, outsourced analytical laboratories, research organizations, and for other oenological needs around the world. Gusmer now strives to make this premiere technology available to the entire industry with local service and support. See the WineScan at the 2014 Unified Symposium Jan. 29 & 30th - Booth #1004. 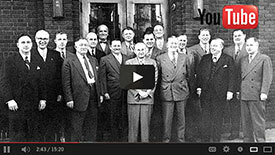 Gusmer Celebrates 90 Years in Business! As we kick off 2014 Gusmer Enterprises, Inc. is excited to be celebrating our 90th year of business. In 1924 Aage Gusmer incorporated the company as the exclusive distributor of a tank coating for the North and South American brewing industry. Today, we are proud to say that through our growth and development efforts during the past nine decades, Gusmer has become one of the leading suppliers of processing aids and equipment to the entire beverage industry and we offer a broad line of filtration products to numerous other markets. As a family owned business, we also are proud of our company culture of integrity, commitment, creativity, and collaboration that allows Gusmer to create and deliver success through experience and innovative solutions for our customers, employees, and vendors. Gusmer Enterprises invites you to join us in celebrating this milestone! Keep an eye out for upcoming contests and giveaways, and as always we appreciate your support and look forward to our continued success together! Gusmer Enterprises, Inc. is seeking a reliable, hardworking individual for a full-time position as a Product Manager in the Fresno, CA office. This individual will be primarily responsible for managing commercial and technical aspects of specific product lines related to the production and processing of wine, beer, distilled spirits, and juice. Must interface with sales, production, R&D, marketing, suppliers, customers in the implementation of the product strategic plan. Strong commercial and technical abilities preferred. For full details or to send your resume, please email mjennison@gusmerenterprises.com with the subject title "Product Manager Job - Fresno, CA". Gusmer Enterprises and EMD Millipore have combined efforts to bring the wine industry the necessary tools to conduct microbiological process monitoring at critical points throughout the winemaking process. Our line of process monitoring tools is designed for convenience, cost effectiveness, and quality. With Chr. Hansen’s Viniflora malolactic bacteria, malolactic fermentation is typically completed in two to three weeks. A high viable cell density means that malolactic fermentations will move forward in an efficient and timely manner. Chr. Hansen not only checks its Viniflora cultures to assure their viable cell densities, but also checks the cells’ ability to survive inoculation and to convert malic acid. These quality checks assure the highest success rate and fastest completions. Use Viniflora to complete your fermentations before it gets too cold. Viniflora bacteria is available in six different strains to meet your winemaking requirements. 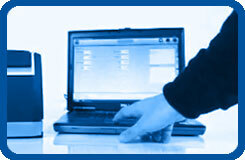 Eliminate the costs of outsourced testing panels today with OenoFoss! Did you know that the OenoFoss Wine Analysis Platform can pay for itself in as little as 300 analyses; while also giving you the added flexibility of instant, unlimited results on your schedule. A typical wine or juice panel costs as much as $115 each, excluding shipping or courier costs, and can take days for results. 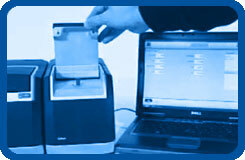 The OenoFoss requires no consumables and has virtually no cost per test. Simply pipette 2 ml of juice, fermenting juice, or wine into the unit to obtain an entire analytical panel in less than two minutes. How much do you spend on outsourced panels? Bucher Vaslin has become the leader in cross flow filtration with innovations that allow winemakers to process juice, wine and lees without diatomaceous earth. The LEESTAR cross flow system can process fermentation lees and wine lees, as well as cross flow filter retentate and centrifuges sludge. Equipped with specialized stainless steel membranes, the LEESTAR processes many types of high solids lees, including bentonite and carbon lees. The permeate wine is brilliantly clear (typically < 1NTU) and can often be recovered to the original wine program at full value without undergoing any additional treatment. The LEESTAR is the solution to rotary vacuum and recessed plate filtration and diatomaceous earth free lees processing. A California winery filtered 5,200 gallons of white wine, bentonite lees at a 20% spun solids level. A recovery of 4,237 gallons of wine was obtained (81.5% recovery), and the wine was of such quality that it retained its original value. Never before have such options for commercially available non-Saccharomycesyeast strains been offered. Chr. Hansen recognized the potential for winemaking beyond the ordinary, and led the charge in 2005 with the introduction of their non-Saccharomycescultures. Years of research went into identifying strains that had the strongest contributions to developing fruit flavor, improved mouth-feel, and flavors and aromas with staying power. These yeast are quickly becoming the mainstay for many successful wine programs, not only as a means of producing more interesting wines, but also as a means of “bio-protection” against spoilage organisms. Chr. Hansen offers three strains of pure non-Saccharomycesyeast that are inoculated into must during cold soak or at on-set of primary fermentation. Subsequent inoculation with your favorite Saccharomyces cerevisiaeyeast one to three days later suppresses the non-Saccharomycesyeast and drives the fermentation to completion. These non-Saccharomycesyeast, when inoculated at a high population level, repress other undesirable strains and contribute greatly to the complexity of the wine. With Chr. Hansen direct inoculation cultures of Oenococcus oeni, no starter preparation is needed. Just add the product directly from the bag to the must or wine. Five different strains are available as a freeze dried preparation in small, medium and large pack sizes to treat 66 gallons, 660 gallons and 6,600 gallons respectively. A complete stock of Chr. Hansen bacteria is available through Gusmer Enterprises. Sluggish Fermentation? Feed the Yeast! 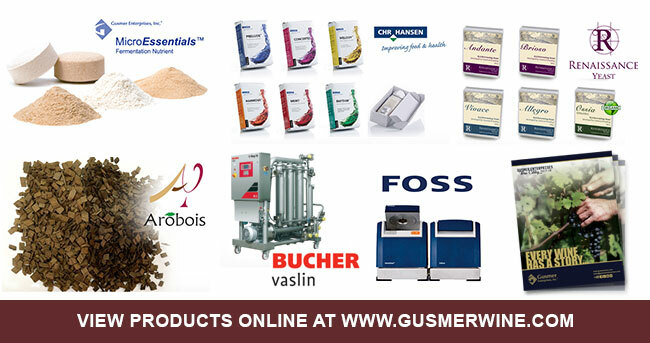 Gusmer Enterprises MicroEssentialsTM yeast nutrient offering is a complete range of yeast nutrients, with multiple products designed to accommodate different winemaking practices. We have sourced the very best ingredients and applied the latest scientific knowledge to develop our formulation of complex fermentation nutrients. 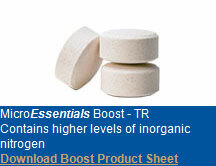 100% organic nitrogen source and complex mixture of vitamins and minerals. Application: Ideal for rehydrating yeast and aiding in restarting fermentations. 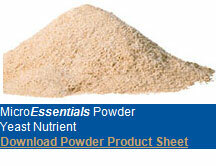 Time-release nutrient supplying a rich mixture of organic and inorganic nitrogen, vitamins and trace minerals. Application: Highly complex nutrient, ideal for most fermentations - added one time at the beginning of fermentation. 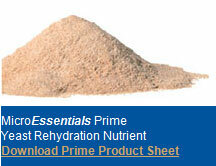 Time-release nutrient supplying higher levels of inorganic nitrogen and lower levels of vitamins and trace minerals. Application:Substitute for DAP when time-release functionality is desired. Can be used alone for easy fermentations or as a supplement to Complete-TR. A powdered form of yeast nutrient supplying a rich mixture of organic and inorganic nitrogen, vitamins and trace minerals. Application:Can be used in combination with other products when analysis shows that vitamin or mineral levels are particularly low. 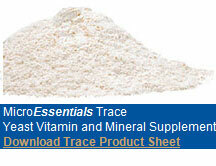 Diverse blend of organic protein sources, vitamins and minerals developed specifically for malolactic bacteria. Application: Strongly recommended for wines that present challenging conditions - high SO2, high alcohol, low pH. This unique enzyme liberates bound terpenes and enhances varietal white wine aroma. For Riesling, Gewürztraminer, Sauvignon, and Muscat. Also for non-terpenic grape varieties, including Chenin, Semillon and Chardonnay. Richer, fruitier/more floral flavor by speeding up clarification and significantly reducing maturation time. We offer complete wine and juice analytical panels for $40 with the OenoFoss. Through the end of November, your first juice panel is complimentary*. 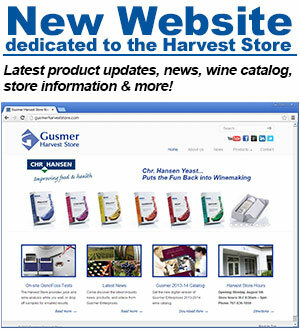 Visit our new website dedicated to the Gusmer Harvest Store for more information. Not every Revolution rejects that which went before. The Wine Revolution embraces the past, and builds upon it for a better future. By understanding the past, understanding what processes and products made better wine, winemakers can envision the future. A future with a new wine experience, created using modern innovative products, producing better wine yield, longer shelf life, fresher flavors and aromas... revolutionary wines! Gusmer has been serving the wine industry for over 85 years. In this catalog we honor the past by bringing you the latest in winemaking supplies, equipment and materials. Through this catalog’s front cover, we illustrate the advancement that’s occurred over the decades by contrasting then and now. We support this advancement and we hope the products in this catalog will help you with your personal “Wine Revolution”. Gusmer Enterprises and EMD Millipore have released a series of newly designed plating hardware including; the EZ-Fit manifold, EZ-Stream vacuum pump, and EZ-Pak Curve membrane dispenser designed to make microbial monitoring easier and more efficient. In-house microbial plating continues to be one of the easiest and most cost effective analyses to bring in-house. With outsourced testing often exceeding $20-25 per test; in-house microbial plating can be done for as little as $1-1.25 per test. Gives much faster results with greater flexibility and the ability to find and/or troubleshoot microbial contamination. Only truly plug-and-play plating manifold. Available as 1, 3, and 6-place manifolds. All connections are quick connecting for fast tool-free disassembly, cleaning, or autoclaving. First vacuum pump designed for microbial plating. Accepts direct liquid intake. No reservoirs needed. Optimized for maximum noise reduction. Bioluminescent system and reagent allowing for colony visibility in 1/3 the time of conventional incubation. 100% compatible with your current plating procedures. These new tools enhance the entire microbial testing product line from EMD Millipore which Gusmer Enterprises represents to the wine, brewing, and allied markets. Visit us online at www.GusmerEnterprises.com for all our products and services. ACM has introduced the first non-destructive CO2 test of the finished, bottled package. The Lab.CO uses a proprietary laser technology for the most accurate dissolved CO2 test available in a compact platform. The test is not affected by glass, test material or other dissolved materials. The single button test displays the result in less than one minute. The Lab.CO is perfect QA testing. Closure and long-term shelf life studies can be performed on the same bottle over time, since the bottle remains sealed. Unlike most bench-top CO2 testers, no opening or piercing of the bottle is required. ACM's line of Laser Refractometers allows the fastest and most accurate Brix measurement in industry. The laser refractometer directly measures the refractive index of a liquid. Unlike traditional process refractometers that typically measure density and extrapolate Brix, the Laser Refractometer only measures the refractive index and is not affected by dissolved CO2 content, alcohol or other components of the test stream. With an accuracy as high as 0.005 Brix and a one second read time, the Laser Refractometer is orders of magnitude superior to other process sensors. ACM GmbH, based in Vienna, Austria, is currently a leader in novel sensing technologies for the beverage market. ACM's line of products includes laboratory laser CO2 measurement, laser refractometers for process sensing, as well as in-line CO2 sensors, densitometers, and other process instrumentation including displays and control systems. The OenoFoss FTIR-based analytical platform allows fast, real time monitoring of your wine's key parameters. No reagents or consumables. Two minutes per test for all parameters together. No need to ship samples. The OenoFoss can offer significant savings that will pay for itself, and gives the additional flexibility of immediate results and unlimited testing on your schedule. 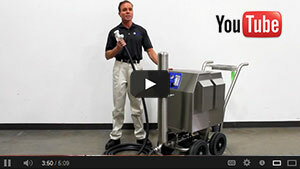 Watch the video and see a customer testimonial. Please join Gusmer Enterprises for an informational session presented around Microbial Control and Assurance at Bottling. Space is Limited - Please RSVP by April 5th. Learn what is needed to properly prepare wines for the best filterability and the lowest micro counts through the bottling process. Topics include; wine preparation, filterability testing, and sanitary hose. Topics include; filter and membrane options, running the filtration, integrity testing, and maximizing throughput and filter economics. Topics include; micro testing options, troubleshooting contamination, and new technologies for rapid micro results. Each of the three sessions is presented in a rotating, small group format with time for questions and answers. Gusmer will also have additional personnel available to answer questions during sessions, during breaks, at the complimentary lunch, or after the program has finished. Space is Limited - Please RSVP by March 22nd. Blaudieck has long been the gold standard of hoses, because it holds up like no other. It's long service life and ability to stand up to the rigors of modern wine production make it the proven value for the money. Just ask a winemaker that uses it! Click here to contact your local Gusmer Enterprises representative for more information, pricing, or samples of ContiTech Hoses. Why is the PVDF cartridge the best membrane for your wine? PVDF has the lowest protein and color binding of any common membrane used in cartridges. Lower binding also leads to less plugging and better cleaning of proteins – a leading cause of membrane blockage over time. For any questions regarding Millipore cartridges contact your local Gusmer Enterprises Representative here. WIN a iPad Mini: Gusmer Enterprises is going Social! Gusmer Enterprises is jumping into the world of social media, and to celebrate we are giving away an Apple iPad Mini! The contest is easy, just start following our Social Media and you are automatically entered in the contest. We are now on Facebook, YouTube, Linked In, Google +, and Twitter. For every Social Media site you follow, we will add an additional entry for you to our contest. So, click on your favorite Social Media site (or all of them) below to start following us as we launch into the Social Media scene. Thank you for your support and we'll see you online! Contest ends March 31st, 2013. For any questions please email us at contest@gusmerenterprises.com. For all rules and regulations Click Here. Gusmer has entered into a new partnership with ACM GmbH to bring a revolutionary CO2 testing technology to the North American beverage market. First released in Europe during 2012, the Lab.CO has been wildly successful as the industry's first non-destructive dissolved CO2 test of the finished, bottled package. A proprietary laser technology quickly and accurately determines the dissolved CO2 in the product. Unlike other units that measure all gases, or extrapolate dissolved CO2 from other parameters, the Lab.CO only measures the CO2 present. There is no opening or piercing of the package required. The Lab.CO is perfect for QC testing, long-term shelf life or closure studies (since the same bottle can be tested over time), or for checking spoilage in finished product by evaluating the CO2 content. Come visit us at the Unified Wine & Grape Symposium booth#1004 to see the New Lab.CO on display. Contitech hose, long considered to be the gold standard in European beverage processing, is now available in America from Gusmer Enterprises as quality wine hose with their Blaudieck line of hose. Available in sizes 1 through 4 inch, with a variety of standard food processing hose fittings, attached with “hand safe“ crimped or swaged ferrules, marrying the food grade stainless steel fitting to the hose interior liner for a secure, easy to clean interface. The Blaudieck is also available with steel wire helix reinforcement for use as suction hose. When your wine deserves the best quality transfer, consider Blaudieck! Min. burst pressure > 580 psi at room temp. For more details regarding the Blaudieck hose visit Gusmer Enterprises or to contact your Local Gusmer Enterprises Representative click here. The Bucher Vaslin Flavy FX offers an appropriate size of cross-flow filters for every winery and budget. Bucher Vaslin's Flavy FX2, and FX3 filters for small wineries offer flow rates of 200 to 1,000 gallons/hour. For mid-size wineries, the FX5 –FX10 models range from 745 to 3,000 gallons/hour. For large winery use, the FX100 and FX400 Bucher filters handle flow rates of 1,500 to 15,000 gallons/hour. The Bucher Vaslin Flavy FX cross-flow filter's design utilizes a low filtration differential pressure (maximum 1.2 bar) and operates with minimal increase in wine temperature. An automatic back-flush system maintains an optimum flow rate. The units are fully automated and can operate around the clock without direct operator supervision. The Bucher Cross-Flow Filter can also be modified to perform juice lees filtration. Click here to see the difference. Winemakers can now process their wine and juice lees, without the need for diatomaceous earth. Evaluate a Bucher Vaslin filter at any facility with a demonstration unit. Full-time cross-flow technical staff is available for demonstrations, training, and service calls. Contact a Gusmer Enterprises representative for more details. 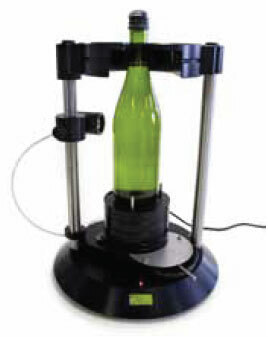 FOSS released the new Finished Wine Calibration Upgrade for the OenoFoss™. This new calibration measures glucose, fructose and lactic acid in wine. This new Finished Wine Calibration can be added to an existing OenoFoss unit or purchased with a new unit. With over 500 OenoFoss units in service world-wide, the OenoFoss is relied on by winemakers for quick, accurate and repeatable analytical results. Click here for more information from Gusmer Enterprises. Gusmer Enterprises is pleased to announce the hiring of Gary Mosby as a Technical Sales Representative. Gary has been involved in the wine business on the Central Coast for the past 30 years. Notably he held winemaking positions with Chalone, Edna Valley, Bailyana and recently was involved with wine sales for Mosby Winery. He earned a B.S. Degree in Food Sciences from UC Davis, with an emphasis in winemaking. Gary will be responsible for all winery customers in San Luis Obispo, Santa Barbara, Ventura, and Los Angeles Counties along with wineries in Arizona, Colorado, New Mexico, Texas, and Utah.